The Tree That Owns Itself in Athens GA is a peaceful oasis amid a bustling residential area. The white oak stands in its own little park. Standing there, looking up at it, there’s a certain amount of peace that overcomes you, even as cars zip around. It takes you back to childhood – climbing trees and looking as far as the eye could see. It’s a reminder of the beauty of nature even though the tree is surrounded by urban and suburban progress. Enjoy its story and reminisce a little as you watch this week’s episode of Stories, Secrets and Sagas. 1 The tree is a white oak. 2 The Tree That Owns Itself has been featured on Ripley’s Believe It Or Not. 3 The property rights of the tree have never been questioned. 4 The deed to the tree cannot be found, but no one questions its validity. 5 The current tree is also known as The Son of The Tree That Owns Itself. 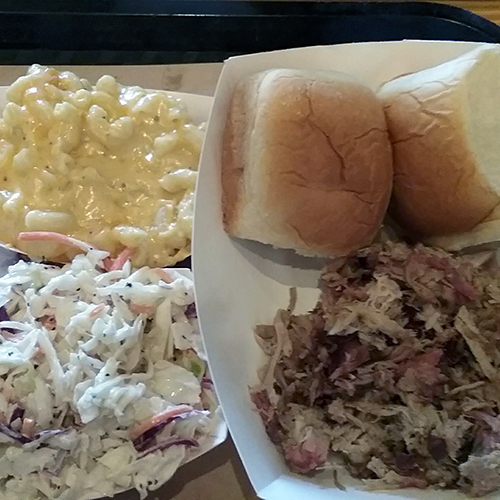 After a day of filming in Athens GA, we were craving barbecue, and, man, were we in luck! Saucehouse Barbecue was exactly what we needed. Each of us was able to completely customize our meal depending on our tastes. They have a variety of meats and homemade sides served on everything from baked potatoes and nacho chips to Hawaiian rolls and rice. Saucehouse also has 9 mouthwatering homemade sauces to suit even the pickiest barbecue enthusiast. The atmosphere was friendly, the music was fun, and the service was everything you hope from a barbecue restaurant in the South. We will definitely be back for more. The next time you’re in Athens GA, stop by Saucehouse and tell them that Stories, Secrets and Sagas sent you! Remember those carefree days of childhood? Those fond memories of hide and go seek, hopscotch and climbing trees? I think climbing trees has to be one of my favorite childhood memories. Trees are sometimes the best listeners as they silently watch our mobile figures moving below their branches. They speak in a language we do not understand, but we do hear them. It's usually in the late afternoon when the thunderheads of summer begin to bloom, a breeze will pass through the leaves. It sounds almost like a whisper of hundreds of small voices in unison. As the wind gets stronger the voices become louder and soon the tree creaks and groans as its very flesh, its core, is stretched and pushed from side to side. I remember the trees of my childhood. Those wonderful gentle giants, which almost beckoned us to climb aboard into their curved and tangled arms. The older kids would laugh as we carefully and very cautiously inched our way higher and higher. And then for the first time in our young lives, we felt the freedom and saw the view...a view a tree sees daily. And in Athens, Georgia one such tree was given a special gift from a child who loved it like family. It is just a simple White Oak in an older part of Athens. But to a small boy growing up in the 1800s, this tree must have left an impression. That boy was William Henry Jackson, son of James Jackson, a Revolutionary War veteran, congressman, U.S. Senator and Governor of Georgia. And when William became an adult with considerable clout, he decided to give this wonderful tree an opportunity to live out its life free of the axe and saw. Free to own itself. This, in fact, is the second generation of the tree that owns itself. The first generation died from erosion and fell on October 9th, 1942. Estimates are that the original tree was over 100 feet tall and somewhere between 150 and 400 years old when it collapsed on that fateful night. By this time the original little boy who loved this tree was also gone. It was probably best that he wasn’t here to see his faithful friend collapse. But it took another young boy, in another period in history to come up with a solution. You see, after the tree’s demise, the lot set vacant for a few years. The spot became quiet and in disrepair. But a young boy named Dan Magill suggested that his mother’s garden club find a replacement for the tree. And as fate would have it, a man named Captain Jack Watson had a five-foot seedling from the original tree growing nearby, in his front yard. Check out our episode on The Double-Barreled Cannon!